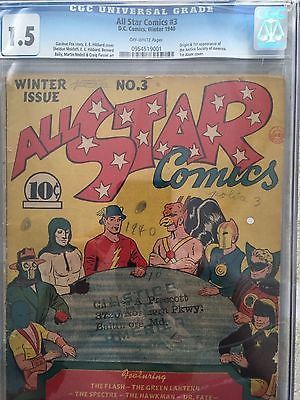 Own a piece of comic book history with this 77 year-old unrestored gem. Many comics from this era were restored so finding an unrestored book in any condition is rare. Before the Justice League, there was the Justice Society of America. Featuring The Flash, Hawkman, Sandman, The Spectre, Dr. Fate, The Atom, The Green Lantern, Hour-man and Johnny Thunder. This key book is probably undervalued and is a great investment and will greatly appreciate in value if/when DC develops movies or TV around these characters. I willing to ship internationally. If importing this book to another country, buyers are responsible for all taxes and import costs. I'm open to serious offers. I charge a flat shipping charge of $15 to Canada, $20 to the USA., and $25 to destinations beyond North America. Shipping includes insurance and signature confirmation of delivery. Comic will be well boxed, packaged and protected for shipping.